Position 19 was one of the fortified positions Division z.b.V. (later 90th Light Africa Division) had occupied along the perimeter of Tobruk in preparation for the attack. At the start of Crusader it was occupied by a platoon of Company 11, 3rd Battalion, Infantry Regiment 255, under the command of Lieutenant Hartz. This was an independent battalion which had been sent to North Africa in May 1941, and was now poised for the attack on Tobruk as part of Division z.b.V. His report on the events leading to the loss of the position give an interesting insight into what it looked like to be attacked by superior enemy forces, including the total chaos this meant in terms of understanding the flow of the battle as a whole, and what is going on around one. To me it provides a reasonable explanation for the oft remarked on habit of German soldiers to continue fighting even when encircled – they could not be sure they were in fact encircled, and they could not be sure how bad it was. So better to hold on. The report also gives interesting insight how an attack on a fortified position looked like from the receiving end. 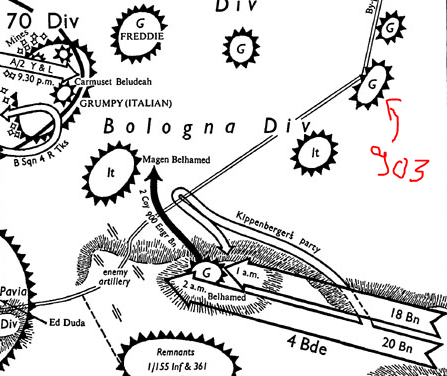 I also find it interesting how long the action took for the Germans, even though the 7 RTR war diary reports that within 10 minutes of crossing the startline the business was over, and orders were given to rally in the forward assembly area. The Australian history has a good bit of detail on the day. 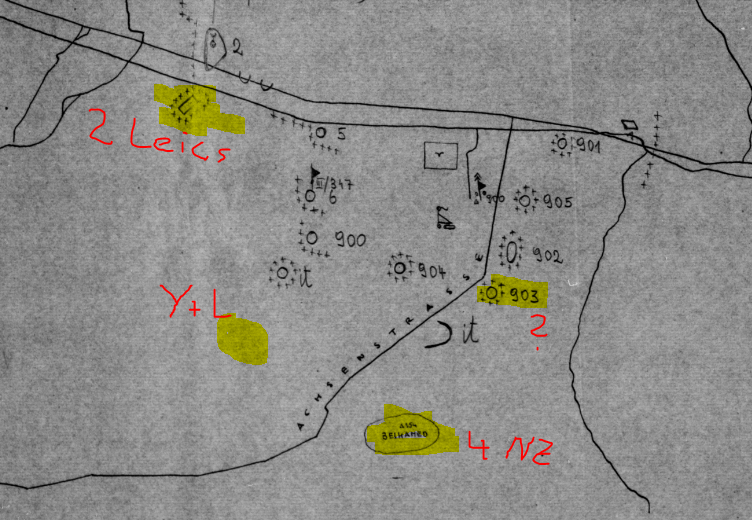 After a bit of map study, comparing a German map showing the location of the strongpoints with the British map of the objectives at this link. I am now convinced that Position 19 was an unknown part of the objective called BUTCH by the 70th Division. BUTCH was attacked by 2nd King’s Own with D Squadron 7 RTR in support (see this older entry). This is confirmed by the Australian history which states that the other two battalions attacking that day did not have tank support during the initial attack, which would rule them out. There were four immobilised Matildas in front of BUTCH, two of which caused such problems to the German garrison, and they were commanded by Capt. Craig, Sgt. Prouse (Y-casualties, both of these were repaired by the crews and returned at night), 2/Lt. Massey, and Lt. Walters (Z-casualty, could not be repaired). Lt. Massey later walked into the Squadron assembly area with 25 German POW. Another interesting bit of info is the helplessness experienced by the German soldiers in the face of two immobilised Matildas. A lot has been said that by late 41 the Matilda was no longer the “Queen of the Desert”. While this was certainly true where 88s were present, this assessment would have provided but cold comfort to the men of Lieutenant Hartz’s platoon. The report was written up on 22 December, when what remained of the then renamed 90th Light had safely been moved into the Agheila position, preparing to receive the rest of Panzergruppe Afrika, which was by then in full retreat from the Gazala position. The report consists of two parts, the first on what happened in position 19, the second on what happened to the remains of the Company 11 afterwards until the division was pulled out of battle. For today, I only translate the first part. Update 22 August 09, the second part can be found at this link now. With my platoon I had occupied the right-flank fortification of Position 19. At 5.30am on 21 November 1941 I heard strong engine noise from the direction of Tobruk. I reported this to the company CP immediately, where it had already been recognised. 6.30am I recognised a strong tank attack on my fortification. Eight armoured vehicles rolled towards it and fired at it with HE rounds and heavy MG (1) . My 3.7cm AT became unservicable because of damage to the breech after the first few rounds. The Italian AT rifle 2cm was rendered unservicable because of a direct hit. No further armour piercing weapons remained to me. Out of 8 tanks 2 remained immobile outside my fortification. They fired all day with their gun, heavy MG, or submachineguns on any target that showed itself in my fortification. (2) Despite this I continued to fire repeatedly on the tanks with my light MGs to prevent the crews from leaving the tanks or communicating. Since 7am there was no contact with the company. At 7.30am I saw that the advance platoon from Magen Suei (3) was pulling back on the company HQ and that the enemy infantry immediately pushed after them. At 14.30 our artillery fired at the enemy tanks in front of us. Since some rounds fell short causing damage to dug-outs in our position, I fired a white Verey light. The artillery stopped firing thereupon, repeating the fire attack at 17.00, but also without success. When darkness fell I tried to re-establish contact with the company. When I was short of the company CP heavy artillery fire fell on it. I worked my way forward to the wire barrier and repeatedly shouted towards it without receiving a response. Since no fire had come from the CP and the left of it since lunchtime I presumed it had been evacuated. I returned to my position and tried now to gain contact to Position 20, whereby I met enemy. After the patrol returned from the battalion CP and reported that this was occupied by the enemy I resolved to evacuate my position. (4) At 23.30 I gave the order to all section leaders, at 24.00 I left the position with all working weapons, as much ammunition as possible, and retreated in the direction of the Via Balbo. At the Italian cemetary I left my platoon north of the road and myself moved to the divisional CP to report there. (1) this is unlikely, since the 2-pdr guns of the Matildas which attacked him were not issued HE rounds. It is more likely that these were guns in direct fire support, or part of the artillery barrage misidentified as direct fire. During the preliminary advance from Tobruk and the attack on the first strong point two of the tanks in Captain Craig’s Troop ran on to a minefield. Both these tanks remained in action throughout the day bringing intense fire to bear on enemy positions within range. As soon as darkness fell he set about recovering both vehicles and do so before midnight in spite of the fact that all work was performed in the open and under heavy enemy fire. (3) This is likely the element of BUTCH attacked by 2nd King’s Own with 19 Matildas. (4) This is likely to have been objective JACK for the British assault, identified by the Australian history as a battalion HQ. Many thanks again to James for getting this item from NARA. Other sources used are the 7 RTR war diary (transcribed by Bovington volunteers), the AWM history “Ed Duda”, and the relevant section from the history of 2nd King’s Own, kindly scanned in by their museum curator.